Robotic-assisted resections prove beneficial in overcoming potential limitation of laparoscopy, but clear evidences on patient’s benefits are still lacking. We report our experience on 100 consecutive patients who underwent right colectomy with either robotic or laparoscopic approaches. Data were prospectively collected on a dedicated database (ASA score, age, operative time, conversion rate, re-operation rate, early complications, length of stay, and pathological results). 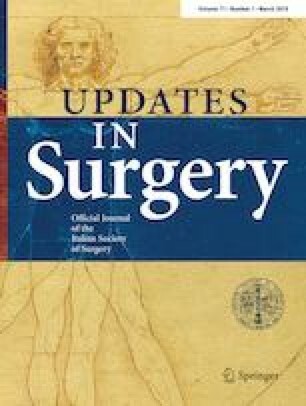 Median total operative time was 160 min in LS group (IQR = 140–180) and 204 min for RS group (IQR = 180–230). Median time to first flatus was 2.5 days for LS group (IQR = 2 - 3) and 2 days for RS group (IQR = 1–2). Length of stay (median) was 8 days in LS group (IQR = 6–10) and 5 days in RS group (IQR = 5–7). No statistically significant difference was found between the 2 groups when the number of harvested nodes, the anastomotic leakage and the postoperative bleeding were analyzed. The 30-day mortality was 0% in LS and RS groups. Conversion rate for LS group was 14% (7/50 pts) and for RS group was 0% (0/50). Minimally invasive surgery is a feasible and safe technique. The RS may overcome some technical limitations of laparoscopic surgery and it achieves the same oncological results compared to LS but with higher costs. The lower conversion rate allows to expect better clinical outcomes and lower complication rate. The Authors have no conflicts of interest or financial ties to disclose. We declare that the study has been conducted according to GCP and ethical standards with no adoption of human or animal source of experimental investigation. This is a retrospective study. Informed consent was obtained by all patients as per local protocol.